After I made a seemingly disparaging comment about comic books on this website, I was challenged to review a graphic novel. And what better graphic novel to review than the one that most sites have dubbed the first modern graphic novel, and also attributes it to having helped spawn the genre and bring it to art form level. 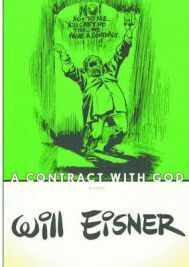 I’m talking about Will Eisner’s 1978 graphic novel, A Contract with God and Other Tenement Stories. From this we can already see that unlike classic comic books, the stories here are far from funny although humor is injected where possible. Also unlike the graphic novels of today, there are no nasty villains with diabolical plans to take over the world while masked super-heroes with super-human abilities fight them. Instead tales contain regular people have been subjected to adverse conditions and in one way or another, have been corrupted (by life and/or circumstance). Because of this, some no longer act with the best of intentions, while others sometimes do heroic things by acting with no more special powers than what they can find within their hearts and through their instincts. The four stories told here are: “A Contract with God”, “The Street Singer”, “The Super” and “Cookalein”. Each one is very individual and each has a lesson to it. The first one deals with gaining and losing faith in the religious sense (as the title suggests). “The Street Singer” tells a story about a man who is just that – someone who wandered the streets singing for cash that appreciative tenants would drop out their windows. This has more to do with hopes and dreams and how often we undermine our own selves. “The Super”, as in superintendent, deals with misconceptions and prejudice based on outward appearances. This theme is revisited in a slightly different way with the last story “Cookalein” which is the Yiddish name for a self-service motel, usually in the mountains, where people would go to get away from the heat of the city during the summer. These cheap vacation spots were often located near much fancier resorts which often provided employment (and/or gold-digging opportunities) for those staying nearby. Despite the morals to these stories, they aren’t in the least bit preachy. Without being told, the reader understands the faults of the characters, and can see how they trap themselves or become trapped, by their circumstances. Their struggles are not unfamiliar to us even today, despite the stories took place around 80 years ago. And because they are realistic stories about real people, we can continue to identify with them and their situations. It could be, therefore, that this is the first truly “classic” graphic novel. Of course, because of the use of graphics to tell much of the story, this is a book that is a very quick read. And yet, because of the humanity that it contains, you might not want to hurry through it, and ponder over these people and their conditions. In short, Eisner has given us brief open-window glimpses into the lives of these ordinary people, and told us their timeless and interesting stories. More importantly, they are the types of people and tales that readers will probably want to revisit every so often. Certainly this book deserves a full five stars out of five, and comes highly recommended. No Comments on "A Contract with God and other Tenement Stories"